Remy hair is the definitive term representing the pureness and extreme fine quality of human hair. Remy extensions are made from premium quality, real human hair. The term Remy means that the cuticles are kept intact, not stripped and the hair cuticles all run in the same direction. Remy also refers to the collecting and manufacturing process, each strand is carefully hand selected according to its quality, length and colour and processed without any chemicals. If you were to sum it up as simply as possible you would say it’s ‘the best hair money can buy‘. When processed correctly the hair strands will remain silky soft, smooth and completely tangle-free for its entire lifetime. The close attention to the Remy Hair collection process guarantees that the cuticles will stay aligned, is healthy and of equal length. The end result is that you have a ‘Remy’ hair extension that is completely natural looking. long lasting and undetectable when attached to natural human hair. Non Remy hair extensions are randomly sourced and then constructed without much consideration to quality or detail. Remy Is made from the finest quality human hair. The hair cuticles are intact and all flow in the same direction from root to the tip. The hair is long lasting. Resistant to matting and tangling. Completely natural looking and undetectable to the eye. The benefit of Remy hair is clear, it can be treated like any normal hair and can be styled in many various ways. The gentle processing means the hair blends extremely well with your own hair. This combined with an affordable price, for many women, makes Remy hair an appealing option over your artificial extensions. Due to the care that is required when collecting the hair and the time taken to meticulously sort the hair, makes Remy the most desirable hair on the market. As Remy hair is the highest grade of real, human hair and is the preferred choice for hair salons and professional hair artists. 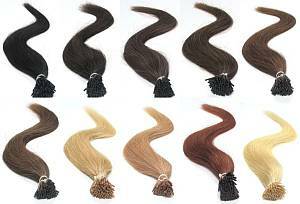 Remy hair blends seamlessly with your existing hair and is the most natural looking of all hair extensions. Remy hair extensions are the most popular human hair extension on the market due to their rarity, quality and value for money. Remy hair is a premium quality hair that with proper care, can last you for a long time. Can be styled like normal hair. Remy hair blends seamlessly with natural hair. Outlasts non-remy & artificial hair. Preferred choice among hair professionals and hair salons. How Do You Know If You Own Real Remy Hair? Good quality hair will feel silky smooth, very soft, look natural and have even strands. Another good indication of true Remy is that with proper maintenance the hair will last you for a long time. Poor quality hair will loose its body quickly resulting in lack of lustre, matting and tangling. Beware Of Remy Hair Imitations! One sign that defines real Remy quality hair is in the price, It’s expensive! Beware of imitations, many companies will charge top dollar and claim their hair is Remy but in fact is artificial hair that has been processed with chemicals to give the appearance of Remy hair. As covered, true Premium Remy hair can be identified by its price, it is the rarest of hair therefore one of the most expensive. True Remy hair will be soft, silky, it lasts for a long time when properly maintained and is resistant to tangling and matting. The hair is collected from a single, healthy donour. The hair collected have their cuticles intact and all the cuticles flow in the same direction from root to the tip making them even. When collected directly from a woman’s head it has usually been cut while in a ponytail. The cut hair is the full length of the strands and is healthy. Will last a long time when properly maintained. Remy hair can be from Asia, India, Russia and Europe. With slight differences in textures, the origin is not as important as to ‘How it was sourced’, that is, that is of good quality and has been sourced using ethical practices from willing participants or paid donours. The processing method of Remy hair is what determines a good end product. Top quality hair extensions will have been processed with care resulting in a silky smooth texture and hair that remains strong and tangle free for a long time. So What Does The 100% Part Mean? The term 100% (as in 100% Remy) is representative of the hair length, meaning that the hair is 100% all one length. The term 100% is also often used as an alternative meaning to ‘Double Drawn Hair’. Double Drawn (100%) equal length. Silky smooth and appears natural. Is resistant to matting and tangling. Colour of hair extension – 1, 1b, 2, 4 …. If you are buying hair for the first time and you’re unsure of what to buy, it is often best to visit a hair salon or extension specialist who can help you choose the correct extension to match your existing hair. Once you are familiar with the types and colours of hair extensions it will be easy for you to buy online with confidence.